Speakers School - Get the Benefit of My 25 years! Speaker's School - Make an investment into your speaking career that will last a lifetime! Speakers School Feb 2013 had attendees from the three Cs: Canada, Colorado and Chicago - a mixture of CEOs, employees of an architectural firm, professional speakers, educators and salespeople. Day one concentrated on the craft of speaking - that's where I share the skills I've acquired over my 25 year career. Day two is all video coaching - attendees practice what they learned and get coaching and feedback. Day three is all about how to get booked as a speaker and/or build a career. Attendee Peter Christman wrote, "The best and most "real world" training I have ever been to in my 50 years in business. Mikki is truly a professional with an equally professional training program. She gives new meaning toe the word "professional." Next Speakers School is April 11-13th with the addition of a Saturday afternoon session with social media guru, Dave Nelsen from Pittsburgh (he's also Vistage Speaker of the Year). 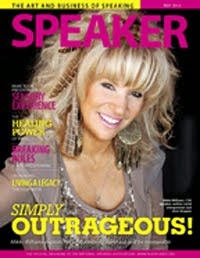 Any questions about Speakers School, one-on-one coaching or The Mikki Mouth Club? Just ask! Contact me on my website or Register Now!